Professionals who bill by the hour understand the need for scrupulous timekeeping. As someone who only recently and cautiously entered the world of the self-employed, I’ve finally come to understand precisely why time is money. Of course, the App Store offers a bewildering array of timekeeping applications to choose from. I selected five apps to test. I discovered two basic types of timekeeping apps: Timers and time-sheets. Timers keep track of when you start and stop discrete tasks. Time-sheets rely on the user’s to input accurate time on task. The best apps keep track of your time and help organize your projects in a format that may be easily shared or exported—as an invoice for example. The worst try to accomplish the same goals, but stumble with clumsy and confusing interfaces, buggy implementation and unhelpful features. Time Is On My Side: A clean, straightforward interface makes TimeLogger one of the better timekeeping apps on the App Store. CostmoSoft’s TimeLogger is a practical, dynamic app that lets you keep close track of your time and ensures you get paid for every minute you’re owed. TimeLogger doesn’t have the loveliest interface in the world, but it’s clean and straightforward. TimeLogger impressed me at once with its user friendliness. At its simplest, TimeLogger lets you start the timer when you begin a task, and stop it when you’re done. But TimeLogger also lets you schedule starts and stops, and allows multiple timers to run at once with different time intervals for people who bill by the hour, half hour, tenth-of-an-hour, or by the minute. Tasks in TimeLogger are classified as categories, which users may add and delete with a few taps. TimeLogger—and all of the other timekeeping applications I looked at—uses a scroll wheel to select and change dates and times. And even though TimeLogger’s clock stops and starts at precise times, it’s still possible to edit time entries in case, say, you worked on a different project that you forgot to log. The app records jobs, clients, specific tasks and your own notes. And TimeLogger helpfully lets you export your time sheets by e-mail either as a plain text or spreadsheet file. But the app has one eccentricity and one drawback that might turn off some users. TimeLogger only lets you assign a task and a client when you stop the clock, not when you start it. The opposite would seem to be more intuitive. Also, the app doesn’t have a way to distinguish between billed and unbilled hours. That would seem to be a tweak the developers could address in an update. Time After Time: A sophisticated app, Timewerks is probably best suited for contractors who work on building and construction projects. 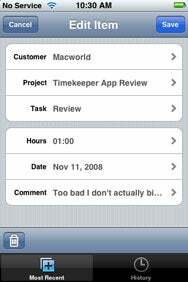 A sophisticated but occasionally frustrating app, Timewerks from Sorth strives to be a comprehensive timekeeping program for the iPhone or iPod Touch. As I spent time working with Timewerks, it occurred to me that it would work best for professionals and trades with projects involving hammers and nails. No accident, I suspect, that the pre-loaded project and invoice examples are for a roofing job. It’s more than I need for what I do, but I could see Timewerks’ appeal to consultants or other pros with a long list of clients and complicated projects to manage. Timewerks lets you track multiple projects, tasks and clients. It allows you to apply different prices to different tasks. 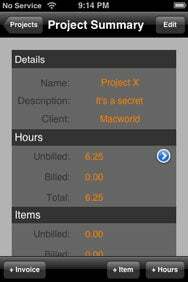 And Timewerks distinguishes between unbilled and billed hours, and lets you create invoices from your phone. You can also export reports by e-mail. 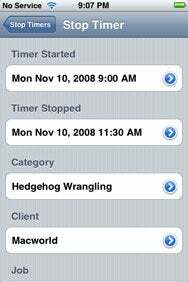 Another nice feature: Timewerks lets you create client records from your device’s address book. Timewerks does not have a timer. It needs one. But a much bigger drawback is the apparent inability to edit invoices. You can edit unbilled hours, but not billed hours. If you make a mistake, you need to delete the entry and start over. I also noticed with Timewerks that there is no field for sales tax. I happened to think of that feature the other day, when I read how California is considering expanding the sales tax to include more services. Timewerks has a minor bug in the way it adds and removes work items. I discovered to my dismay that my categories weren’t appearing. I had to restart the app for my changes to appear. Out of Time: Time Tracker’s interface is too counterintuitive for my tastes. SDK Innovation’s Time Tracker is a timesheet-style app, which appears easy to use at first. But the app’s maddening and counterintuitive interface makes Time Tracker more of a time waster. The app is supposed to have a timer, but there is no obvious way of knowing this because there is no start button. Although Time Tracker does have fields for customers, projects and tasks, there is no way to budget time. And while Time Tracker lets you e-mail your data, the formatting disappears. Time, Time, See What's Become of Me: Less of a timekeeper than a time management aid, Time Manager Pro measures seven categories of time. Telience.com’s Time Manager Pro seems to have been developed with Clifton Webb’s role in Cheaper by the Dozen in mind. As the efficiency expert father of 12, Webb embarrasses his kids with his efficiency schemes, notably by showing their teacher how to take a bath in the time it takes to play one side of a phonograph record. The app aspires to answer the question: Where did the time go? 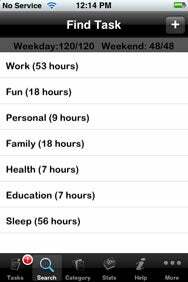 Time Manager tracks seven discrete (but often overlapping) categories of time: Work, fun, personal, family, health, education and sleep. As a sort of global time management aid, Time Manager is first rate. It works exactly as advertised. You can create weekly time budgets and review your task history with a tap of a button. An especially clever feature is the statistics window, which lists in percentages how much time you’ve spent in the last week and month on work, fun, health, etc. The app’s timer is excellent—it actually has a start and a stop button. Although Time Manager aspires to keep tabs on all aspects of your life, the app isn’t as sophisticated as others at helping manage specific projects or tasks. This isn’t an application for project management; it’s an app for life management. (Telience.com also offers a free “lite” version of Time Manager. Time Out: TimeXchange has a Web component, though testing found that uploading new information from the app to the site was unreliable. Actus Technology’s TimeXchange is a companion application to timexchange.net, a social utility Web site that lets workers, managers, supervisors and clients log, approve, and share project time-tracking data. Although TimeXchange includes options for projects that involve solo contractors, the service is probably best suited to teams of consultants working from different locations. Setting up and managing projects online is a breeze. But the app itself does not work as seamlessly as advertised. When you first log into TimeXchange, you are prompted for your e-mail address and password. You will then be prompted to update your projects. TimeXchange will download the latest information from its Web site. The app lists all of your current projects. That worked just fine for me. Trouble is, TimeXchange is much less reliable when uploading new information from the app to the site. To add information, you tap on your project and then tap Enter Time. Up pops a screen with a button to Enter Duration. You can select the day, duration (in hours and five-minute increments) and a description of the task. When I went to timexchange.net to verify my data, however, the hours appeared but the task descriptions did not. I tried this several different times, taking care to ensure I filled each field and tapping the Done key when I was finished—which is significant, because there is a giant red Delete button at the bottom of the screen where you would expect the submit feature to be. So I submitted my time correctly; TimeXchange simply didn’t receive it. I imagine seeing a lengthy list of “no task entered” would be frustrating to a project manager, if I had one. It was frustrating enough for me. The other problem with TimeXchange is that you can only submit time and task information, but you cannot review the time or task details you may have already logged. And once you’ve submitted the time from your device, it’s gone. When I mentioned this to a friend who has been an IT consultant and project manager for 20 years, his one-word assessment was: “Useless.” Simple report viewing should be a no-brainer of a feature here. 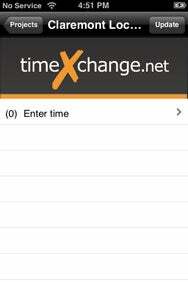 And for some reason, there is no way to log expenses such as miles and meals in TimeXchange. In those key respects, Actus’ free iTimeX app is no different from the $3 version. Turns out, I spent a lot of time over the past month trying to figure out how to log my time. I disqualified the timesheet-style apps as a matter of personal preference. I’ve always hated filling out timesheets, and the timesheet apps only reinforced my distaste, although Timewerks had potential to convert me. I wanted a timer that’s easy to use and would keep track my projects down to the minute. I wish Time Manager was more of a business productivity tool—it had the nicest interface by far, but it didn’t meet my business needs at all. So I settled on TimeLogger, a solid app for self-employed professionals who value their time and their money. All applications reviewed are compatible with any iPhone or iPod Touch running the iPhone 2.x software update.